DUBAI, United Arab Emirates, July 1, 2013 (ENS) – In the Emirates, used cooking oil from McDonald’s restaurants is not wasted. It fuels the trucks of the chain’s fresh produce supplier. McDonald’s UAE said Friday that Del Monte, the company that supplies its vegetables and fruits, has implemented a pioneering biodiesel initiative that the restaurant chain first suggested. A total of 20 vehicles from Del Monte’s logistics fleet are now running on biodiesel made from McDonald’s UAE’s used vegetable cooking oil. Del Monte’s entire fleet of vehicles is expected to run on biodiesel by the end of 2013. 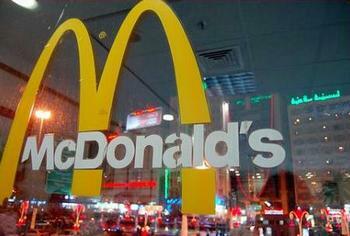 McDonald’s has 78 restaurants in the UAE. They are all Emarati-owned and operated by the Emirates Fast Food Corporation, with Rafic Fakih as the managing director and partner. Used vegetable oil is collected from McDonald’s outlets across the UAE and converted into 100 percent biodiesel by McDonald’s cleantech partner, Neutral Fuels, a Dubai-based biodiesel manufacturer. “Since the biodiesel campaign was first launched in 2011, we have seen an increasing interest from companies around the region,” said Fakih. “Del Monte’s participation in this campaign serves as a testament to the success of this initiative and fits in perfectly with our objective to encourage other UAE companies to consider incorporating similar campaigns,” Fakih said. Companies that want a renewable transport fuel option that is commercially available have to turn to biodiesel – it’s their only choice. Independent studies have shown that, on a lifecycle basis, biodiesel usage emits roughly 80 percent less of the greenhouse gas carbon dioxide than burning petrol diesel. In addition biodiesel has lubricating properties which help prevent premature engine wear and failure. Biodiesel also acts as a cleaning detergent in fuel systems, improving efficiency and reducing maintenance. “For the past two years McDonald’s UAE has proven that biodiesel is a commercially viable long-term sustainable alternative,” said Karl Feilder, chairman and chief executive of Neutral Fuels. “We operate a closed loop system for McDonald’s UAE where every drop of biodiesel is converted from their own used vegetable oil and is used in 100% of their logistics fleet 100% of the time in an ongoing recycling process,” Feilder explained. Elsewhere around the world McDonald’s works to convert its used cooking oil into an asset, rather than a waste. In Europe, more than 80 percent of used oil is converted into biodiesel. About 28 percent of the fuel used in the European logistics trucks comes from biodiesel. Roughly 37 percent of this fuel comes from biodiesel generated from used cooking oil, and McDonald’s Europe is looking to increase this percentage going forward. By the end of 2008, McDonald’s UK was recycling 100 percent of its used cooking oil for biodiesel to fuel delivery trucks in that market. This equates to an emission savings of more than 3,500 tons of CO2, which is equivalent to 1,500 family cars being removed from the road each year, the company says. For more than 10 years, McDonald’s USA has worked with supplier RTI to implement a bulk cooking oil delivery and retrieval program. Used cooking oil is collected and taken back to a larger distribution facility where it is sold for re-use to a variety of vendors, including biodiesel companies. Today nearly 75 percent of the eligible U.S. restaurants are enrolled in this program, representing more than 8,675 U.S. restaurants. Today, the average participating U.S. McDonald’s restaurant recycles about 1,450 gallons of used cooking oil a year. In addition to more efficient restaurant operations, plastic and corrugated packaging have been eliminated because cooking oil no longer needs to be delivered in 35 pound plastic jugs in corrugated boxes. This eliminates the creation of packaging in the first place and keeps additional packaging waste from going to the landfill.